I will admit it: I get horribly awkward around some people. I stumble over myself, my words, and usually make a mess of things. I always get frustrated by how differently I act around them as opposed to how I act around others. Somewhere along the line I allowed how others defined me (or how I thought they defined me) to become a part of how I defined myself when I was around them. If I trusted a person then I could relax. Otherwise I stressed about how I behaved and what I did and said. Even though I didn’t want to think of myself the way they did I allowed their definition to smother me. In my struggle to prove I wasn’t what they thought, I often confirmed their beliefs instead. This past year, however, things were different. And I want to tell you what helped me, even when someone was waiting for me to mess up again. I have friends who use the phrase “wear love.” The first time I heard it in this phrasing I smiled, but it also helped me envision things differently. So, when my path crossed people who defined me badly and I could feel their definition begin to envelop me, I took a deep breath and chose differently. I wore God’s love instead. I envisioned His love around me, protecting me, defining me, and holding me up. Not only did it affect the way I saw myself, it also affected how I treated them as well. It’s not like I wrapped them up with a bow and stuck them in my pocket to be BFF’s forever and ever. But I was able to release the defensiveness and panic and instead be kind, generous, and loving in my words, actions, and responses. All because I stayed in God’s love and allowed Him to define me. I know I will need to intentionally make this choice again and again. It doesn’t come naturally to me, but I hope the more I choose to wear God’s love the more I don’t have to think about making the decision. I will just be. What do you wear? 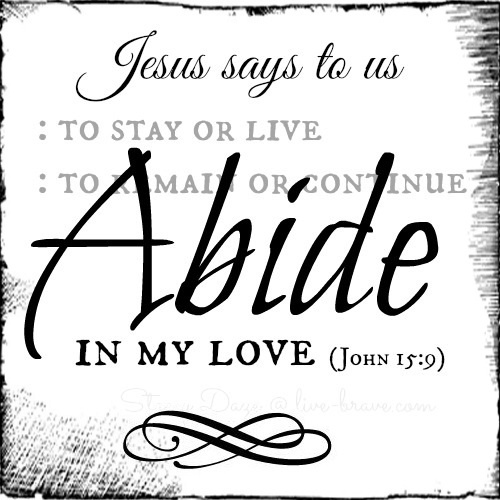 Where do you abide? I think it’s time we were all brave enough to accept God’s love for ourselves, remain there, and watch to see what a difference it makes. I love John 15:9. Abiding is something I am learning to practice. Not easy as you said. And I agree, we have to be intentional. Thanks Stacey for your transparency. This blessed me! Thank you, Melanie. it is something I must be intentional about or I simply forget it. It’s crazy. You would think when it works so well we would fall into it easily. What a comfort and security to be clothed in God’s love. I have been draped in peace for about a year now, fully. And it has made all the difference. Thank you Stacey for sharing your wardrobe. Thank you Lesley! It does make a difference. Remind me next time I forget! Wow – I do that too! But didn’t realize it until I was no longer in that friendship. I will now remember the clothing of God’s love when I start to feel that way in other relationships. It’s a beautiful image. Thank you! How awesome that you were able to do it when you needed it without even thinking! I’m growing to be less defensive so that I can wear love more. The two don’t go together so well.